Escape from Obesity: Eat Your Veggies: Radishes! I hate radishes. I have hated them from the time I was little and first bit into the little red ball that was in my salad. Yuck! Bitter and TOO HOT. I have never liked the spiciness and bite of a radish. So why am I posting about radishes? Have you ever *cooked* a radish?? I have... and WOW, are they delicious! Somehow, when cooked they lose their characteristic hot taste and become (get this): sweet! Yes, they taste mild and sweet and very much like potatoes when cooked like home fries or hash browns. (I didn't believe it either. Check it out). I saw this idea on various low carb message boards. Radishes are low carb and low cal; one cup of sliced radishes contains 19 calories, 1 g protein, 2g fiber, no fat, and 4g carbs. They are rich in vitamin C, folate, and potassium as well. I started with a cheap bag of radishes from Walmart because I was *sure* I was not going to like this. I washed them and trimmed the ends. Then I used my new Salad Shooter (which I LOVE!! It slices and grates so fast!) to cut the radishes into very thin slices. You could shred them if you prefer. I put them in a nonstick pan with a bit of olive oil over medium-high heat. I sprinkled them with onion powder and black pepper, and put a lid on the pan. 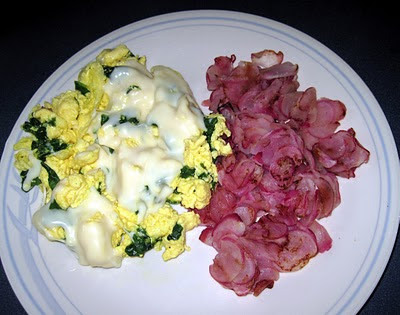 Egg beaters scrambled with spinach and Mrs. Dash, topped with light Swiss cheese and served with a delicious side of radish home fries! Sooo good, you won't believe it! Try something new this week, whether you think you like radishes or not! Who knew??? I amazed that they taste so different just by cooking them! Thanks! I'll definitely be trying this one! I have always hated radishes, but you are right... I have never cooked them! Thanks for the tip! Never, ever heard of cooking radishes!!! I actually do like them in a salad, but forget to buy them. I will have to try this! I think I might do that tonight! This post was def. an two-thumb "Upers"
Boiled radishes are NUMMY !!!! I have tossed them in with corned beef or other boiled dinner type dishes. They make a great sub for ed potatoes if you are trying to go low carb. Would you believe that a very popular French breakfast is sliced raw radishes on a buttered baguette ?? I have got to try this. I love potatoes...but, they don't love me. lol. Thanks for sharing. That sounds so good! I always skip over the radishes on the salad bar, and I've never thought of cooking them. Great idea! Hi Lyn - Wow - I may have to try this. Anything I've ever made that you recommended has been great. Everything. So perhaps I'll whip up a batch! Thanks! I'm so happy you're doing so well and getting down into the low 220's. You are working hard for this and deserve every success. Did you know that radishes have the shortest maturity of vegetables? This means that you home gardeners can get these babies growing quick. I might just have to give these beauties a try, now. Looks really good! Is this what you use for the Cauliflower too? (the shooter?) I have the same feelings about radishes so maybe I need to give this a try too. Yes, the Shooter is so much easier than grating my fingers to death on a cheese grater. LOL! Works wonderful for the cauliflower. Wow!!! Interesting!! Will definetly try this!! Thanks for the idea!!! Interesting! I have never cooked a radish. I'll have to try it. First time I've heard of anyone cooking radishes. But thanks for the idea. My doctor wants me to cut down on carbs for a while and I was running out of good substitutes. I never heard of cooking radishes!! I am going to try this! Thanks for the tip! I've always been scared to try cooked radishes because it sounds really gross! Who wants a mushy pile of spicy and bitterness? Not me! (And I actually like radishes in salads.) I was surprised to hear that it becomes sweet and tastes similar to potatoes. I'm always looking for potato alternatives! Thanks for this post! I love radishes, but never thought of cooking them! I'm going to have to try it! Thanks! How long have you had your shooter? Does it cut onions well (regular not green)? I've read that mixed comments on that. Thanks for the new idea. I love radishes raw as long as they are dipped in Hidden Valley Ranch Dip. I know I know, thats bad. I've only eaten radishes uncooked and I've never liked them. I will have to give cooked radishes a shot. Add me to the "never heard of that" camp. Can't wait to try. I too just started medifast and I'm enjoying your blog. Congrats on your success so far! That is something I am going to have to try! Hi. I've just caught up on the last 3 days and your post about reaching a new low. Congratulations on finding your milestone. But more than that, I thank-you from the bottom of my heart for showing that it can be done. It being, staying true to your plan to become healthy and lose weight through a period when life threw some very rotten stuff at you. I know that you are still going through the rotten stuff but you are now so much stronger than when you began. It is amazing to me that you haven't yielded to weariness. I trust that this is the spur you need to get on with the next stage of your life. I am right here cheering for you. I must try this 'new' way to cook radish as although I like them in salad I never can eat a whole bunch while they are nice and fresh. That is amazing about the radishes. When I realized I wouldn't be extending my market season, I decided not to plant radishes in the greenhouse, as we wouldn't eat them. But, this Sunday, I'm planting radishes! Huh. I like radishes but don't buy them often. Maybe I'll try them cooked. Let me know how those turn out. I have seen mixed reviews on roasting them. For those who are sauteeing them as I did, make sure you cook them til they are translucent and soft. I love radishes raw, and I've been sauteeing them for years - love them, but the family doesn't. I've tried roasting them and didn't care for them. They get kind of mushy. This was a great post, and hope everyone likes trying something new! 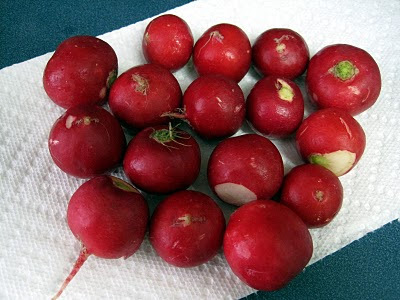 I cut them into chunky chunks, spread them out on a pan, sprayed them lightly with Pam, sprinkled with salt and pepper, and roasted them in our small toaster oven because I didn't have enough radishes to warrant heating up the big oven. I roasted them until they were tender and had browned places, stirring them around occasionally. And then I proceeded to eat the whole batch myself (partly because my husband thought I was insane for *cooking* radishes, but mostly because they were so good I couldn't quit eating them)! DEFINITELY a keeper recipe! Next, I'm going to try the sautee method. 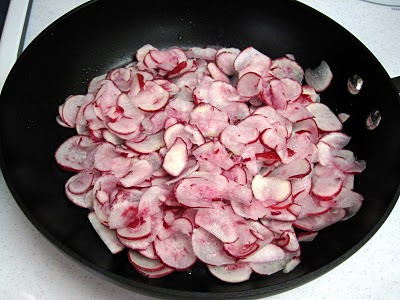 Today, I broke out my small food processor, sliced a bunch of radishes and sauteed them. This way, they taste even better than the chunked and oven-roasted method!! I tried your radish recipe and I really liked them. I also do not normally care for them. My husband on the other hand didn't care for them much. Oh well more brussel sprouts and radishes for me.